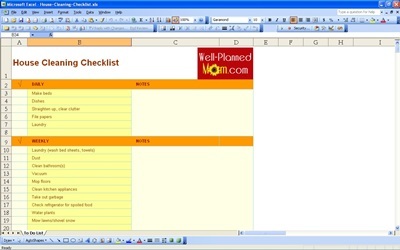 Organize your household chores with this house cleaning checklist originally created by well-plannedmom.com. This simple house cleaning checklist is designed to help you stay on top of household tasks to keep your home clean and spotless. Use the link at the bottom of this page to begin downloading this free printable house cleaning checklist. After you have finished downloading this free Excel checklist, you can customize the file according to your needs. The house cleaning checklist is organized by daily and weekly activities. Examples of common household tasks are already included in the Excel checklist, but you can insert additional rows to add more tasks to your house cleaning checklist to customize it for your life. Additional space is added to the right side of the house cleaning checklist for notes. Use the print preview function to view your house cleaning checklist before printing. You can use this house cleaning checklist to remind yourself of what needs to be done, or you can create versions for your children to remind them of their chores. This is a free Excel checklist to be used for all of your household chores. Go down the list and mark finished tasks in the household cleaning checklist. With this convenient printable house cleaning checklist, your house will be neat and tidy before you know it! See the link below to begin downloading the house cleaning checklist. You can also create Excel checklists for homework, family activities, shopping and more, using our Excel templates. Other handy Excel checklists can be found in our huge library of free Excel templates.